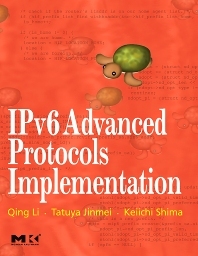 IPv6 Advanced Protocols Implementation is the second installment of a two-volume series on IPv6 and the KAME implementation. This book discusses those protocols that are found in more capable IPv6 devices, are commonly deployed in more complex IPv6 network environments, or are not specific to IPv6 but are extended to support IPv6. Specifically, this book engages the readers in advanced topics such as routing, multicasting, DNS, DHCPv6, mobility, and security. This two-volume series covers a wide spectrum of the IPv6 technology, help the readers establish solid and empirical understanding on IPv6 and the KAME reference implementation paralleled by none. Software engineers; network operators and designers; IP industry researchers and developers. Qing Li is a senior architect at Blue Coat Systems, Inc. leading the design and development efforts of the next-generation IPv6 enabled secure proxy appliances. Qing holds multiple US patents. Qing is a contributing author of the book titled Handbook of Networked and Embedded Control Systems published in June 2005. He is the author of the embedded systems development book titled Real-Time Concepts for Embedded Systems published in April 2003. Tatuya Jinmei Ph.D. is a senior software architect at Internet Systems Consortium, Inc. He had been a core developer of the KAME project since the launch of the project through its conclusion. In 2003, he received the Ph.D. degree from Keio University, Japan, based on his work at KAME. Keiichi Shima is a senior researcher at Internet Initiative Japan Inc. He was a core developer of the KAME project from 2001 to the end of the project and developed Mobile IPv6/NEMO Basic Support protocol stack. He is now working on the new mobility stack (the SHISA stack) for BSD operating systems.